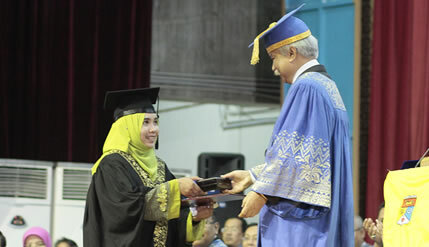 BANGI, 1 November 2014 – Nurul Iman Mohamad Anuar Kamal a recipient of the Royal Education Award at the 42nd National University of Malaysia (UKM) convocation today is an all rounder, excellent in her studies as well as community work. She is also a debater in Arabic, something which is not easily accomplished even by native Arabs. Anyone who tries to study Arabic knows that it is not easy to master the language. So it is a feat for Nurul Iman who can argue and debate in Arabic all over Asia. Nurul Iman who is modest of her ability said it was nothing special as she got involved in debating to improve her spoken Arabic. When you enter an Arabic debating competition you are forced to make your sentence in a very short time while it also helps you to strategies your arguments, she said. The eldest daughter of three siblings did not come from a privileged background. Her father was a blacksmith and mother was a factory worker. She said she saw how her father and mother had worked so hard to bring them up and give them education. Her only intention is to help her family. Nurul Iman said she called her father as soon as she was informed that she was chosen to receive the award remembering what her father had said. Her father always reminded her that no matter how hard he work it was all worth it when he hears about his children’s success. Her advice is to always give everything you have in any endeavour. You can’t expect excellence to follow if you try to be smart and cut corners. Nurul said she was not an excellent student but just an average one before she came to UKM including when she was studying for her diploma in another University. Things change at UKM because she was given the opportunity to prove herself and she was given so much support by the university. Nurul said the turning point that made her determined to excel was what happened to her father. The place where her father worked was sold off leaving her father jobless. It was then that she became determined to be the best in whatever she does. When asked how she balanced her time between studies, co curricular activities and community work, she said it was having a schedule and sticking to it. And there were times when she was stressed because there were so much to do. She is inspired by her parents. Her father who lost his job is now turning that adversity into an opportunity and has become an entrepreneur. And her mother has become a mathematics teacher in a school in Sungai Petani. She modestly said her success is not just because of her hard work but mainly due her parents’ prayers.